There was disappointment on the double for most racegoers at Punchestown yesterday as Samcro was taken out of the Morgiana Hurdle and then the popular veteran Faugheen was overturned by stablemate Sharjah in the feature contest. With the morning withdrawal of Supasundae and late defection of Samcro, Faugheen appeared to face a straightforward task and Ruby Walsh set out to make all on 2/5 shot. Rachael Blackmore kept him honest on Tombstone, the only one of the four eventual runners not trained by Willie Mullins, but he dropped away before the turn into the straight. Just when Faugheen looked set to go clear though, Sharjah, a Galway Hurdle winner but beaten behind Bedrock and Samcro at Down Royal, cruised past him. Paul Townend rode the 7/2 shot out to win by seven-and-a-half lengths. "I travelled well the whole way, got the feeling Ruby was in a bit of trouble when I was still doing it well and I had fitness on my side," said Townend. "The ease of the win surprised me a bit, but he promised to win a big one a few times last season. I wouldn't write Faugheen off." Both Sharjah and Faugheen are owned by Rich Ricci. Of the winner, Mullins said: "I may give him a little break and come back in the spring, but after doing that today, it looks like we'll have to go to Christmas (Leopardstown) with him. "We'll see how he is when he comes out of this race. He's had no break between Flat racing and the Galway Hurdle and everything." 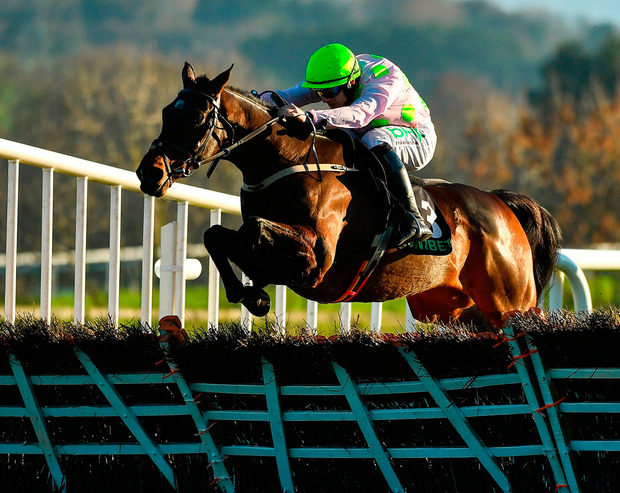 Of Faugheen, Mullins added: "Faugheen missed two or three hurdles. I'd have expected him to find a bit more, but he didn't. The decision is made to stay hurdling and I think we'll just go out in trip as we had intended." As for Samcro, trainer Gordon Elliott felt he had no option but to pull him out due to the lack of rain at the venue. Elliott will consult owners Gigginstown House Stud first, but he prefers going to the Fighting Fifth Hurdle at Newcastle at the start of next month ahead of running in Fairyhouse's Hatton's Grace Hurdle over the longer distance of two-and-a-half miles. Mullins enjoyed a big-race double as Some Neck survived a stewards' inquiry to edge out Blow By Blow in the Grade 2 Liam & Valerie Brennan Memorial Florida Pearl Novice Chase. Sent off a 7/1 shot, the Ricci-owned son of Yeats was settled behind the leaders by David Mullins, and moved into third approaching the second last, but was far from fluent there. A swifter jump at the last saw him move right alongside Blow By Blow (1/1 fav), and he soon got to the front, keeping on well to prevail by a neck. The jockey completed a brace of his own when teaming up with his father Tom to land the Nally Bros Hyundai Longford GAA Handicap Hurdle. The well-backed 9/2 favourite led approaching the last in this three-mile event, and dug deep on the run-in to hold off Jack Fiasco by half a length. Despite Samcro's absence, Elliott still left with two winners. The first came in controversial circumstances as Henry de Bromhead's Cuneo (3/1) was disqualified after finishing first past the post under Rachael Blackmore. Cuneo came home half a length to the good, with Satoshi (14/1) and Relegate in second and third, with just a short head between them. As Relegate (4/9) was the one hampered, Cuneo was placed behind her, and so the amended result meant that Satoshi was a fortunate winner. Malone Road completed the Elliott double built on his burgeoning reputation with a brilliant display in the Mervyn Gray Construction (Pro/Am) INH Flat Race. In what looked a two-horse race according to the betting, Mullins' Mt Leinster had plenty of followers having won by 22 lengths on his debut. Malone Road had slightly more experience as he had won a point-to-point before his first bumper at Down Royal and ended up being sent off the 5/6 favourite with Mt Leinster at 6/5. Patrick Mullins set a stiff gallop on Mt Leinster, but Jamie Codd took up the running turning into the straight and ended up pulling eight-and-a-half lengths clear.